This paper presents a new way to design and operate reverse osmosis desalination plants using a multitude of relatively small, fully integrated RO modules that could replace large pressure centers. The desalination plant could then coordinate production with energy prices by automating the number of modules in operation. By leveraging cheap energy, operating costs would be substantially lowered. 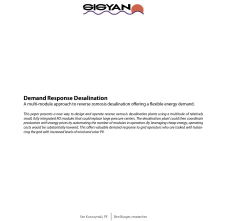 This offers valuable demand response to grid operators who are tasked with balancing the grid with increased levels of wind and solar PV.